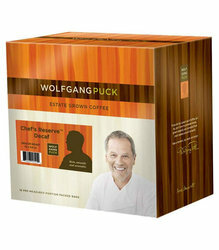 Wolfgang Puck Office Coffee - Reserve DECAF. A medium roast coffee decaf version of the Wolfgang Puck Reserve Line of coffees. European style decaf, using only the finest beans and processes. No watered down taste here, this is a decaf drinkers dream!